Live album seeing the band play both Seven and We Are Legend, their latest album, in full. 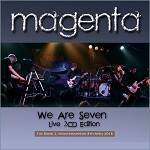 More information: Magenta release live album seeing the band play both Seven and We Are Legend, their latest album, in full. 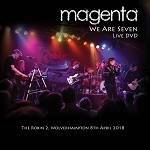 We Are Seven is available as a 2CD and 2DVD release (each release contains the whole 2 hour plus concert) and was recorded at The Robin 2 in Wolverhampton on 8th April 2018 when the band performed the albums Seven and We Are Legend in their entirety for the very first time. The performance also saw the band expand with two additional live members on oboe and flute.